First there was the phenomenon of online shopping, and now we all know that's pretty mainstream and exceptionally handy, particularly during the holidays. Then the ever growing, fast and fierce "pop up" shop was introduced to our fashionista needs and ever‐changing desires. Next up, the fashion world is going mobile! Spanning the nation with stylish threads from contemporary to vintage and designer for less. Fashion trucks are giving many a time‐crunched woman and man, a new spin on how to look their best. These hip, fashion trucks are part of a modern change in our habits of eating, shopping, home furnishing, getting our hair done and even buying floral arrangements. There is even a Mobile Retail Association, better known as the "West Coast Mobile Retail Association" aka the WCMRA that currently has 20 members from Southern California to the Pacific Northwest. 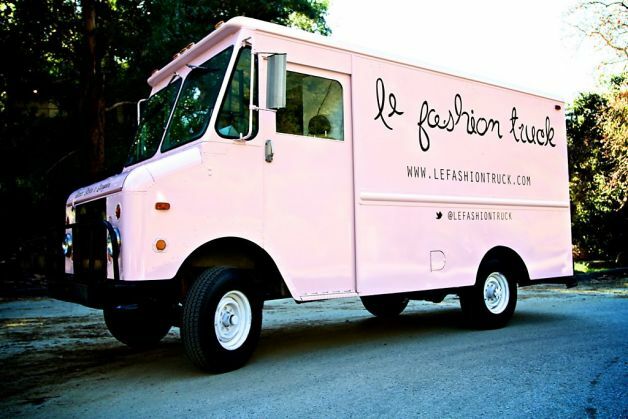 Founding members Jeanine Romo and Stacey Steffe, of the successful pink Los Angeles version, aptly named "Le Fashion Truck" were kind enough to share some insight with me. The women foresee the expansion of the Association growing rapidly each year, and anticipate it adding up to 50 members. So whether you're in Boston, Austin, New York City, San Francisco, Miami or Portland boutiques on the go are on the uber rise. They say history repeats itself, and that seems to be the case here. In 1958 Woolworth commenced their mobile store in a chic cherry red double-decker London bus in Basildon New Town, Thetford and Haverhill in the UK. It was very well received by customers, but frowned upon by local shops at the time. It was then brought up for discussion, with the city councils, and later was disempowered. Half a century later, trucks displaying clothes, appeared in New York around 2009 by esteemed designer Alice + Olivia as a creative way, to have their latest collection on view cross country. I asked brilliant and bubbly Le Fashion Truck co‐owner Jeanine, some further questions regarding being the good, bad and ugly regarding being a mobile wholesaler. First off, I wanted to know where and how long, did it take them to orchestrate her truck? Apparently, it's as easy as checking out various milk trucks on Craig's List, where they purchased theirs for a mere $2500 (it's a 1974 International Box truck ‐- bumper to bumper is 18' and 16' wide). It then took Jeanine and Stacey a few months to renovate and decorate it. Which cost them another couple of thousand dollars. All things said and done, with lease prices exorbitantly high and stationary addresses becoming less desirable, the business of mobile fashion is quickly catching on like wildfire. "All we had to do, was feed the meter, and made that money." Not bad, considering you don't have to deal with crazy landlords, or weather, as you can change your location on the drop of a dime, and capture that sunshine where foot traffic and prospective shoppers will be roaming. All is done via facebook, twitter, blogs, vlogs and the glorious free mega platform of social media. Word of mouth indeed is not a dying industry. Jeanine loves that she gets to see all kinds of different people, men buying sweet gifts for their significant other, or girls having fun on their lunch break, etc. The worst part of the biz, is that you literally are in a moving vehicle, which translates to, make sure it is in tip top shape with regards to the brakes working, and the engine and tires running as seamless as possible. Another perk to this truck revolution, is its multiple uses -- not only is it a public truck, but one can hire them also for private parties! "Book it out and negotiate it a couple of weeks in advance, and you and your girlfriends can shop and drink some wine, and 10% of purchases go to the hostess." Also any order of $50 or more, the truck grants you free local delivery, especially convenient for a last minute present. Tell me your thoughts and inquiries on this latest means of consumerism? I would love to hear from you, and help you on any factoids I may have left out...And with that, I leave you with Jeanine's favorite Oscar Wilde quote " You can never be overeducated, or overdressed."